Buried in the flood of posts on my Facebook feed today was a video of Adobe XD embedded in a sponsored ad from Adobe Creative Cloud. As someone who's a self-confessed geek and always up for new software to try, it just didn't seem appealing to try. What was wrong with Photoshop? Why would Adobe see the need to create another tool for us to use? This video sold the idea of creating super-quick, interactive and multi-device concepts that were a breeze to drag and drop together. There were libraries that appeared to have predefined styles grouped together for speed and the changing of colours of fonts throughout - almost in a similar way you'd change one variable in SASS or LESS to universal amend. At this stage, I have just installed Adobe XD and haven't yet tried it. The above is purely from seeing the 1min 6 second video once so forgive me if anything is factually incorrect, it's my first impression. On first opening Adobe XD there's a nice little screen that offers me an in-app tutorial on creating my first app or exploring on my own with a template. Call me typical, I went straight for the template. And yes, I do tend to skip instructions when building flat pack furniture. Where's the fun in that!? Ok, this initially looks very familiar. Kind of like an inverted Photoshop screen. We have the tools on the left, standard properties on the right but what's exciting is the 'Prototype' option near the top left next to 'Design'. Live preview? If you've been using the updated Photoshop over the last 6 months or so, you'll most likely be familiar with Artboards. I've personally found this pretty useful and I do like them. 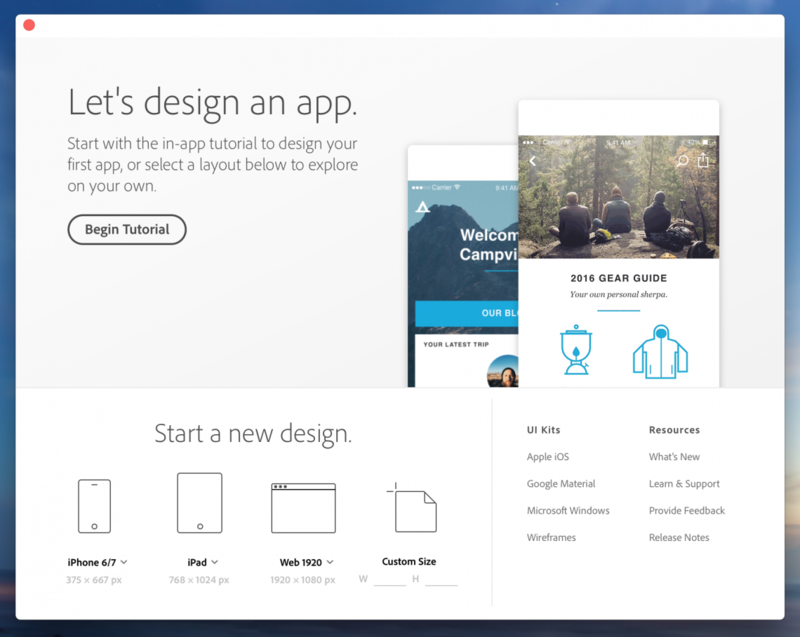 With Adobe XD, there's an Artboard icon as part of your initial tool set. When clicked, a menu offers lots of artboards specifically for certain devices such as the iPad Pro, Watch, Surface Pro 3 and 4 as well as the standard 'Web 1280' etc. Something tells me I should finally learn and read instructions before diving in head first. I can easily create artboards, add text and the tools feel good and fluid. The app is really fast and slick too (MacBook Pro mid-2014, 8GB DDR3, 2.6GHz). I've just spotted the play button in the top right. This opens a preview of my app and has a record icon with time. I can record usage of my app and play with it to test it out. I really like this feature, looks like this is going to be a gentle learning curve. Without a particular project in mind or something to work with, there's nothing much that offers itself up to try so I'll give the tutorial a go and see what this new offering from Adobe can actually do. There are three main features / areas that stand out; design (similar to Photoshop), prototype (creating and hooking up links making your design interactive to some level) and live preview and recording via the play button. The good news is that I'm actually keen to get stuck in and learn more as I have loads of questions that I want to answer. What will we do instead of slicing PSD's? How will we get to development from prototype? We've got a new project starting in the next couple of weeks so Adobe XD will definitely be on stand-by.